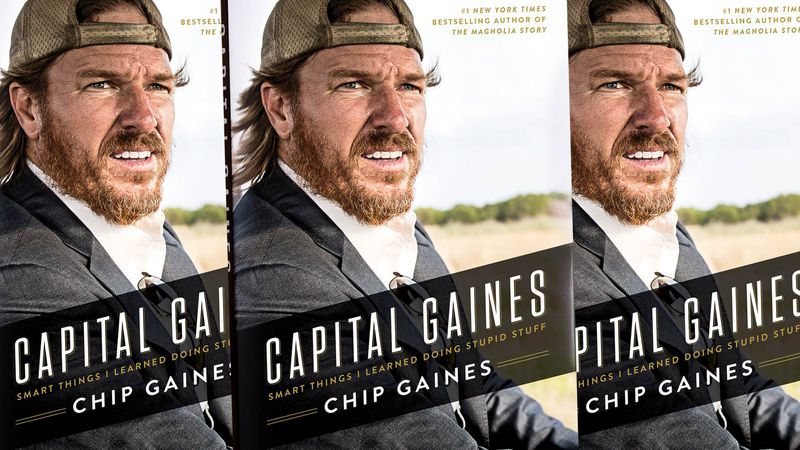 I’m dictating this post through Siri because, after seeing the cover of a new book by Fixer Upper star Chip Gaines, I can no longer read or write. It is called Capital Gaines: Smart Things I Learned Doing Stupid Stuff, and will probably be as (if not more) successful than his and wife Joanna’s first book, The Magnolia Story, which has sold over 1.3 million copies. I watched this Today show clip during which the cover was revealed in hopes that Chip and Joanna would shed a little more light on the contents of the book (could it really just be about Chip doing stupid stuff? ), but they spend most of the segment discussing the cover photography. “I really wanted it to be about me and the expression that I wanted to capture,” Gaines said of the image, which he says was “an ad lib moment” taken on his way to the photo shoot. “I couldn’t be more excited to share some of the experiences (read: DUMB decisions) in my life that have led to some of my biggest breakthroughs in business,” Chip says. “I want people to know that they can take risks in life and achieve what they think is impossible, even with a few bumps in the road along the way.” His mentors taught him to never give up and his family showed him what it meant to always have a positive attitude despite your circumstances. Throw in a natural daredevil personality and a willingness to do (or eat!) just about anything, and you have the life and daily activity of Chip. I get why learning that a big dumb idiot can pinball through a Rube Goldberg machine of bad life decisions and end up with a wildly successful career, loving family, and hit show on HGTV is inspirational in theory, but is it really that fun to read about if it hasn’t happened to you? What if you’ve made fewer dumb decisions than Chip Gaines, taken more risks, and ended up with nothing but debt and disappointment? Wouldn’t reading a book straight out of a Christopher Guest movie with a cover photo of a dopey, thousand-yard stare make you feel like you’re the only unlucky person in this entire miserable universe? It’s not that I have any problems with Chip and Joanna Gaines (beyond their association with a church that promotes conversion therapy), it’s that “Whoops We Tripped Right Into This Goldmine” is a genre of aspirational writing that I will never understand. Capital Gaines hits bookshelves October 17.